The Circle of Love is like a donut. A round, tasty, chocolate frosted donut. With sprinkles. And creme. And oh for the love of god who cares about love just shove donuts to my face!!! Sometimes love is a circle, but sometimes love is a straight dead end line. EDIT: This comic made it to the top of Reddit’s /r/funny, and was second on Reddit’s front page. As often happens when I post a comic to Reddit, it stirred quite a discussion. This time the conversation was about love, relationships, marriage and obesity, including some confessions from people who lost weight for love or to maintain their relationship, and a very interesting comment from a clinician who treats overweight people with diabetes on a daily basis. As often happens with art, it gets interpreted in ways the artist didn’t expect. 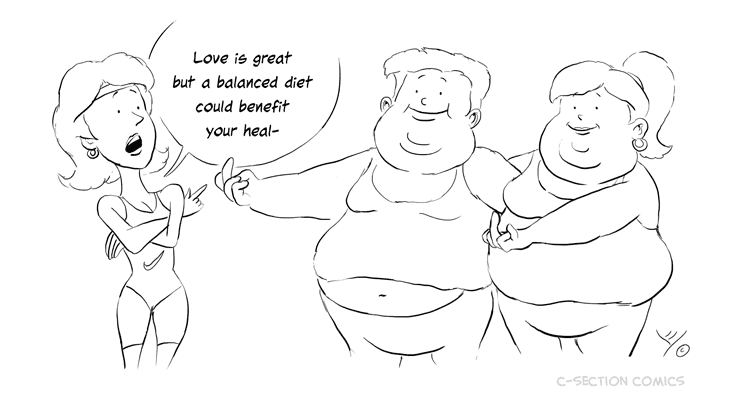 Some people saw this comic as me encouraging people to become fat and neglect their health, while my intention was in fact to support people who accept themselves, and their loved ones, without allowing anyone to discourage them. This is of course is not a substitute for people taking responsibility for their health. Where’s the balance? That’s for you, and your physician, to decide. Anyway, you can read the actual comments on Reddit.